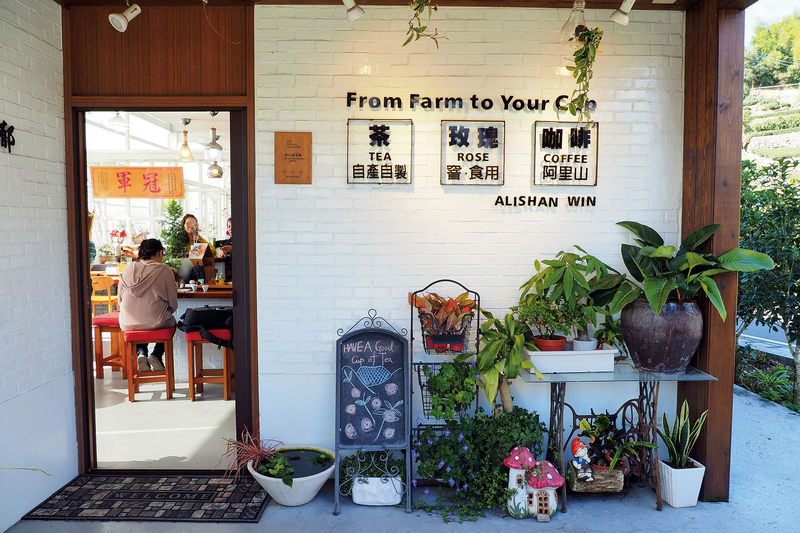 Alishan Win’s “one-day tasting master” experience enables visitors to try ten different varieties and roasts of Alishan teas. This tea selection system can help guide young people and people who are not regular tea drinkers into the world of tea. By offering tasting experiences and plantation tours, tea estates are bringing greater cultural depth and diversity to the tea industry. Alishan Win grows organic roses and produces floral oolong teas to attract younger consumers to its shop. Visiting tea estates while touring scenic spots in tea-growing areas adds cultural depth to an outing. Taiwanese tea is renowned far and wide, its unique flavor a product of Taiwan’s mature tea processing techniques and a terroir that spans tropics and subtropics, high elevations and low. Where should you begin your exploration of Taiwanese tea? You could visit tea merchants and teahouses, or even take a Lunar New Year’s tea estate tour that includes a guided trip around a tea plantation, as well as tea processing and tea tasting experiences. 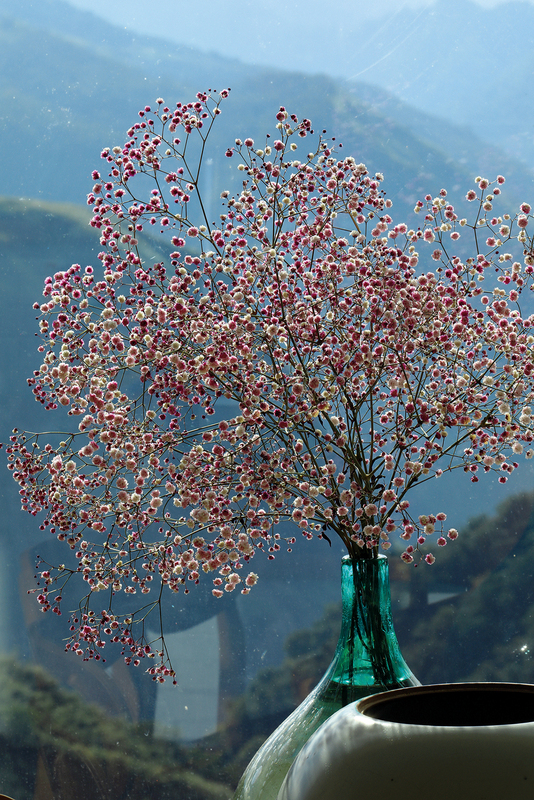 Such tours allow you to sample fine teas, take in the nearby sights, and enjoy life. “A journey of a thousand miles starts with a single step.” On an early morning planned long in advance, we ascend to the village of Xi­ding, 1250 meters above sea level, to watch the sun rise. Strolling the Er­yan­ping Trail through the tea plantations and bamboo groves that cover the mountainside, we can see an unbroken line of mountains in the distance and have a panoramic view of the green tea plantations below. The “tea trail” terminates at Ali­shan Win, a tea estate that offers a tea tasting experience tour. Xiding is an important hub for the production of Ali­shan tea. Ali­shan Win is located near the 55-kilometer marker of the Ali­shan Highway. 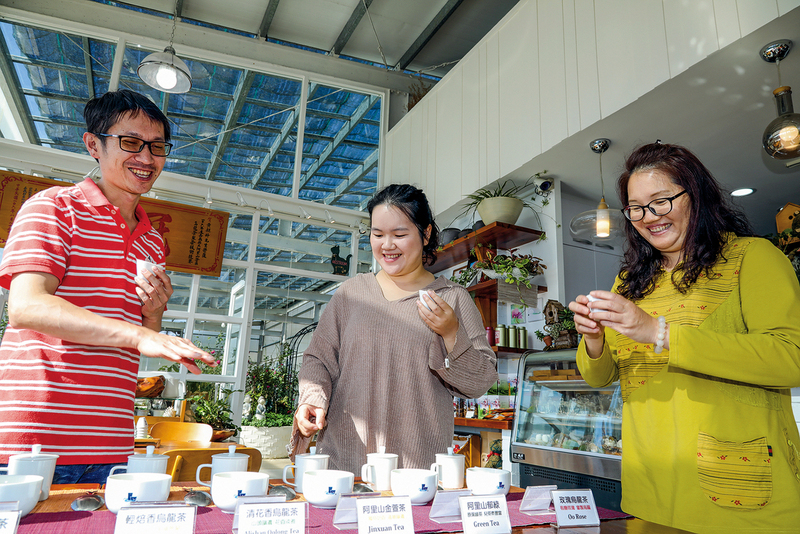 Estate owner Alon ­Huang, a second-­generation tea farmer and a judge for the Mei­shan Farmers’ Association’s Ali­shan high-mountain tea competition, urges the visitors on one of the estate’s tea tasting experience tours: “Pick up your teacup, and breathe in deeply! Keep on inhaling!” After identifying the scent, whether sweet, fruity or floral, he has them examine the steeped leaves. One cup follows another. After smelling ten different cups of tea, we use a tea tasting spoon to scoop up some of the liquid and slurp it, holding it in our mouths for a moment before swallowing. Is it light and fresh, or rich and full-bodied? We make note of our olfactory and gustatory responses to each tea. 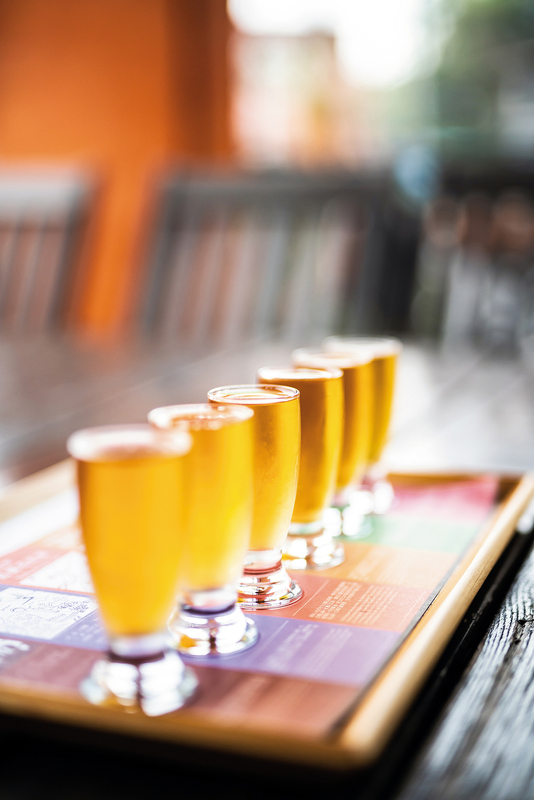 Alishan Win’s “one-day tasting master” program for consumers visiting Mt. Ali begins with a guided tour of the mountain tea plantations, then continues with the tasting experience. The format emulates that of the farmers’ association’s tea competition. 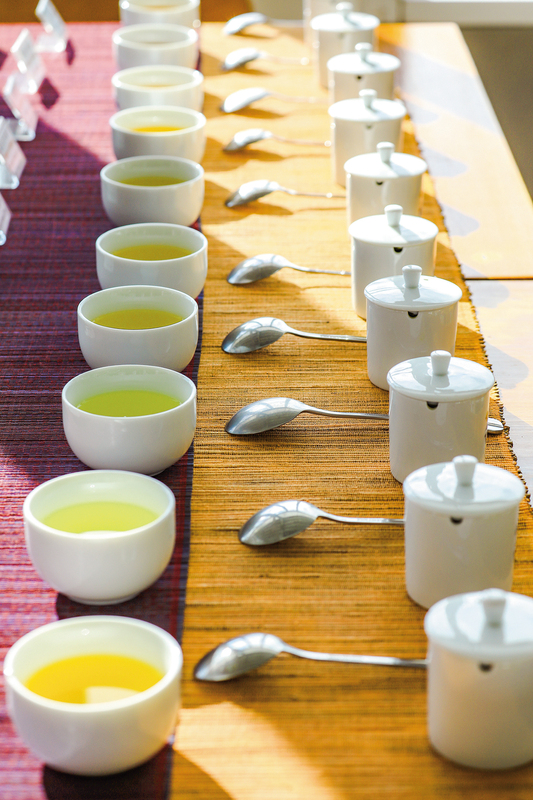 Each sample cup contains three grams of tealeaves steeped for six minutes, and then allowed to cool before tasting. Each is also labeled with the tea’s name, to help consumers keep track of the ones they enjoy. “Consumers needn’t spend a lot to be able to drink Ali­shan tea,” says ­Huang. “The NT$200 tasting experience provides ten different teas across a range of roasts and levels of oxidation.” The one-day experience simply takes the tea competition judging process, and transforms it into a fun way for consumers to find teas they like. A second-generation tea farmer, ­Huang chose to return to his hometown to grow and process tea after graduating from Tam­kang University in 2005. But he wasn’t some rich kid who had the family business handed to him on a platter. After two years back at home, his father gave him roughly two hectares near ­Niae’ucna (Chinese name Li­jia), a south-facing Tsou Aboriginal village in Ali­shan Township. He works the plot, which stands 1,450 meters above sea level, himself, while his two older brothers each farm their own plots elsewhere around Alishan. Four or five years after beginning this endeavor, Huang and his wife were dreaming of opening a storefront on the Ali­shan Highway (Provincial Highway 18). They had a hard time finding a piece of land there until 2009’s Typhoon Mo­ra­kot closed down the highway for six months. What was a disaster for many proved a blessing in disguise for ­Huang: the typhoon damaged the local economy, making local landowners less resistant to selling, and enabling ­Huang to real­ize his dream of opening a shop. Alishan Win grows organic roses and makes floral oolong teas, attracting younger consumers with its combination of flower viewings and floral teas. Visitors can order teas by the cup to better appreciate the different layers of flavor that emerge with different brews, and the heady fragrance of the high-mountain teas. They can also share a pot of Ali­shan tea with their friends for just NT$150‡180 before strolling along a footpath and enjoying the views of Elephant Mountain. 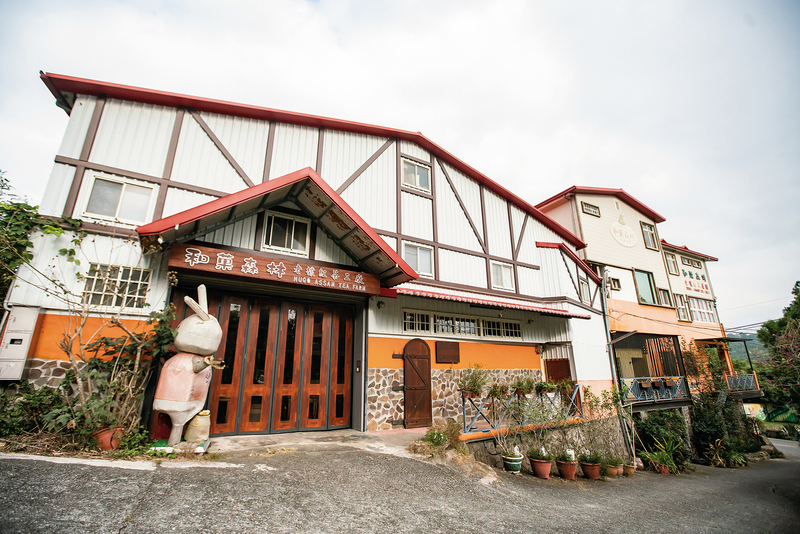 Yuchi Township in Nan­tou County is the home of Sun Moon Lake Black Tea. After taking in the beautiful weather and the lovely lake and mountain scenery, you can visit Hugo­sum, a tea estate with orange-exteriored buildings located off Provincial Highway 21 on Xiang­cha (“fragrant tea”) Lane. Hugosum’s “tea making experience tour” enables visitors to pick some Taiwan Tea No. 18, known as “Jade Black,” or perhaps some Assam tea tips from an old bush, and roll the tea with their own hands. You roll and twist it, break up any lumps, and then turn it over to the estate’s tea processors for fermentation and roasting. The experience shows you just how complicated the tea making process is, and also provides you with a tin of tea that includes some you made yourself. Teas can be sampled and tasted the way you would fine wines. 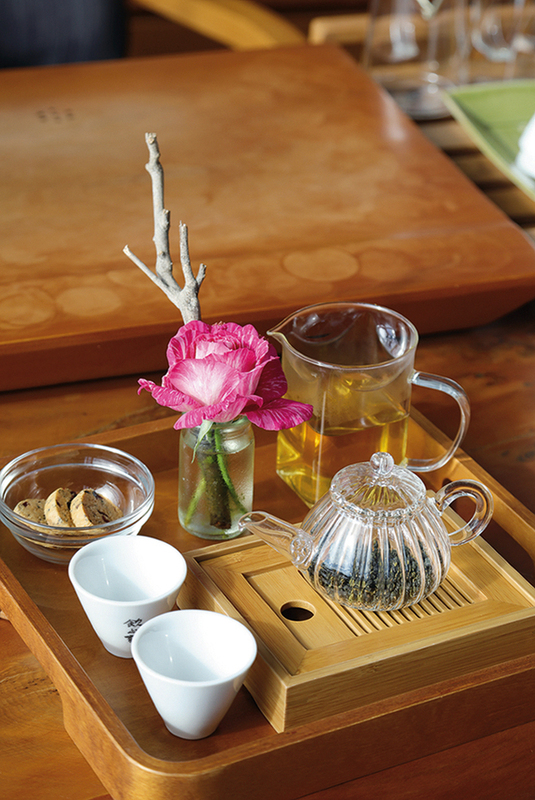 At Hugo­sum, you can steep five grams of Taiwan Tea No. 21, known as “Rose Quartz Black,” in 180 cc of hot water to create a brilliant red brew with hints of fruit and honey; or enjoy the cinnamon and mint fragrance, clear red color, and richly layered flavors of Taiwan’s world-renowned Jade Black. You can even sample ice creams and cakes made with finely ground Jade Black. Denise Shih, Hugo­sum’s general manager, stands next to a 60-year-old Assam tea bush. A Sun Moon Lake native who was one of the key drivers behind the upscaling of the area’s black tea industry and turning tea processors into tea estates, Shih recalls the industry struggling with poor sales when she returned home in 2005. The decline was related to a larger decline in Taiwan’s black tea industry as a whole. Her father, Shi Chao­xing, who was a master tea maker and later the manager at Taiwan Tea Corporation’s Mo­chiki Tea Factory, lived through the industry’s highs and lows. When 1999’s Jiji Earthquake badly damaged the Sun Moon Lake area, the Small and Medium Enterprise Administration of the Ministry of Economic Affairs and Yu­chi Township’s mayor worked hard to prop up the black tea industry and turn it into a local specialty industry. Meanwhile, the Tea Research and Extension Station introduced the “Taiwanese style” Taiwan Teas Nos. 18, 21, and 23, providing new flavors of black tea. 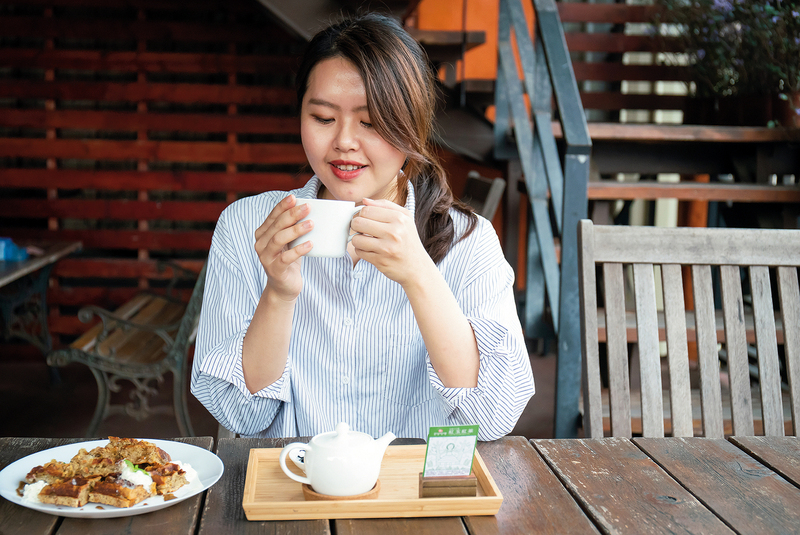 With local growers also moving to hand picking of flushes, Sun Moon Lake tea had the opportunity to transform from a mass-­market commercial product to a high-end tea. 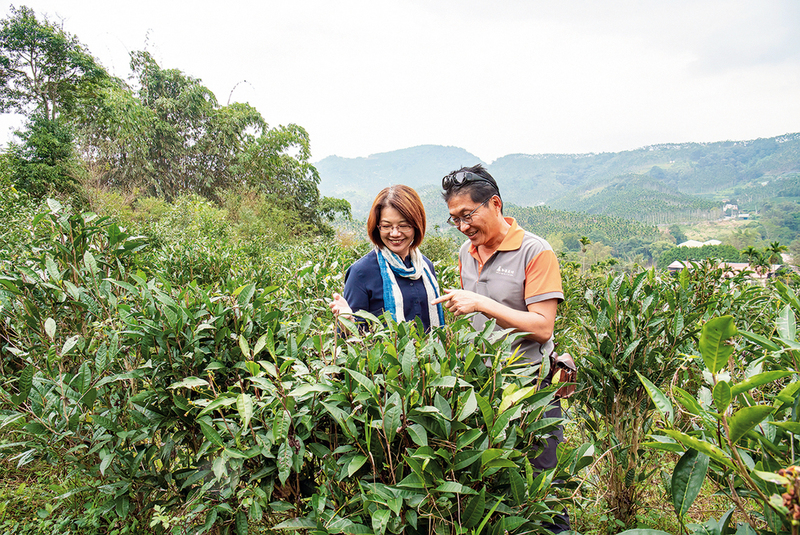 A grateful Denise Shih says, “We jumped on the bandwagon, using it to revamp and upgrade our products.” With Sun Moon Lake’s recovery from the earthquake, Yu­chi Township’s land in black tea cultivation has grown to between 600 and 700 hectares. Shih does an outstanding job marketing Hugo­sum. She has not only obtained two certifications for its products, but has also used fine teas, the tea estate experience, and promotions to introduce young people and others unfamiliar with tea drinking to the world of tea. On sampling Sun Moon Lake black tea, even visitors from abroad have been heard to exclaim about its quality and ask how they can purchase it in their own homelands. Hugosum responded to this enthusiasm by making its Sun Moon Lake black teas available on global ecommerce platforms such as Amazon and eBay in 2018. “We have customers from all over the world, and even send packages to Russia,” says Shih. Alishan Win and Hugo­sum have consistently been among the 28 tea estates included on the Council of Agriculture’s “Light Up Taiwan Cha” list from 2014 to 2018. A visit to any of these 28 estates, which span the length of Taiwan, offers travelers a chance to take in the jade-green mountain tea plantations and enjoy a deeply cultural journey. Cheng Yung-­ching, head of the Grains and Specialty Section at the Council of Agriculture, says that while Taiwan’s small farmers are adept at growing and producing tea, they generally aren’t very good at marketing. The idea behind Light Up Taiwan Cha is to help farmers further develop their tea processing skills, while also helping them cultivate their packaging and marketing skills with the goal of increasing the industry’s value-added by integrating services and tourism into their tea growing and processing businesses. He sees tea estates as potential intermediaries between the art of tea and its manufacture, and suggests that they can pave the way for other tourism-related businesses in their areas, bringing still greater diversity to the tea industry and to tea culture.